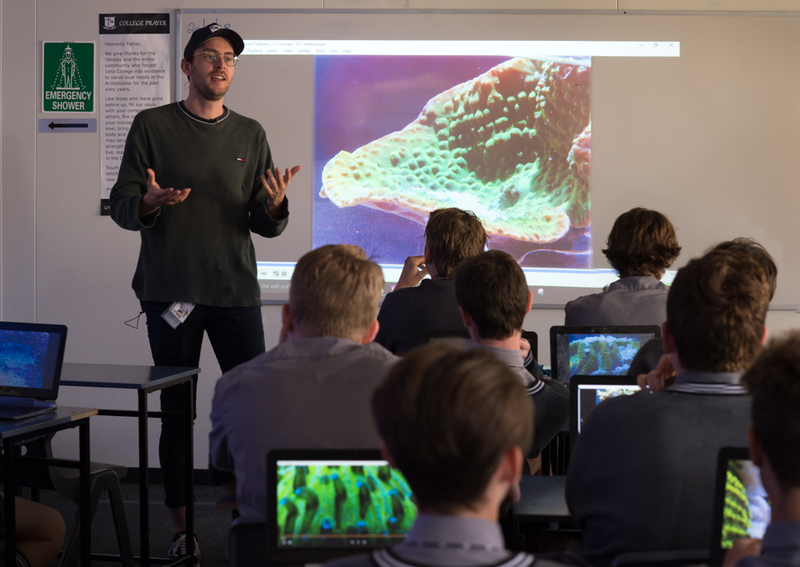 A QUT coral reef researcher, who has been working with high school students to undertake novel marine research in their classroom, is investigating whether the teenagers have made their own, new scientific discovery. Brett Lewis from QUT’s Science and Engineering Faculty designed the unique curriculum experience in collaboration with Iona College and, for the past 18 months, the students have been working with him to examine how corals in Moreton Bay have adapted to human influence on the environment. With the project still six months away from completion, Mr Lewis said the possibility of a scientific discovery in the high school classroom was exciting for both him and the students. “In studying how sediment is being removed from the coral tissue, the students look to have uncovered a brand new way that this is being done,” Mr Lewis said. 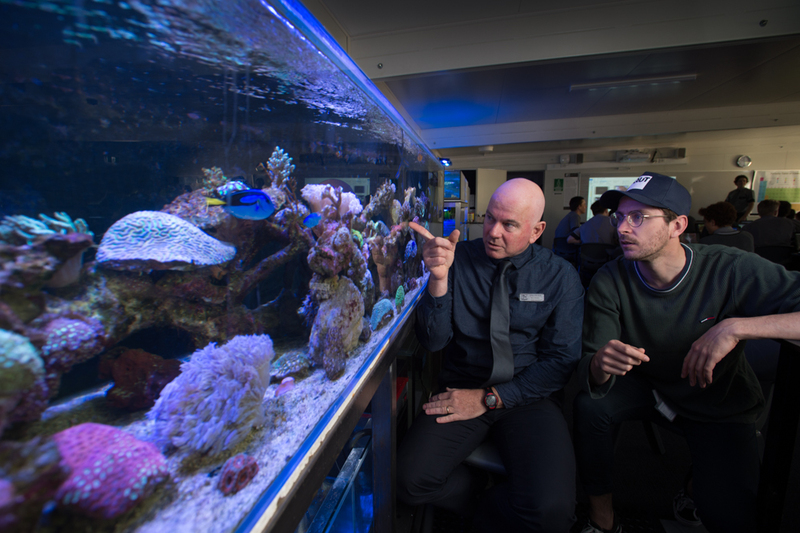 The innovative project follows research by Mr Lewis and academic supervisor Dr Luke Nothdurft in 2016, which established the biomechanics of coral bleaching for the first time – and attracted international attention, including from celebrities such as Leonardo DiCaprio. Marginal reefs, such as those in Moreton Bay, have been a focus for Mr Lewis’ work since then, with the area a potential key to understanding how global reefs can be managed as the planet’s climate changes. “Moreton Bay is perfect for us to be able to establish how the Great Barrier Reef is going to be able to survive this environmental stress,” Mr Lewis said. “But before we can consider that further we need a baseline to work from and that means establishing the existing environmental threats in the region and examining which corals are capable of adapting to those conditions and which corals are not. “The work the students have been undertaking is therefore very relevant, as they are investigating how corals respond to the increasing influx of sediment caused by both global warming and urban development. 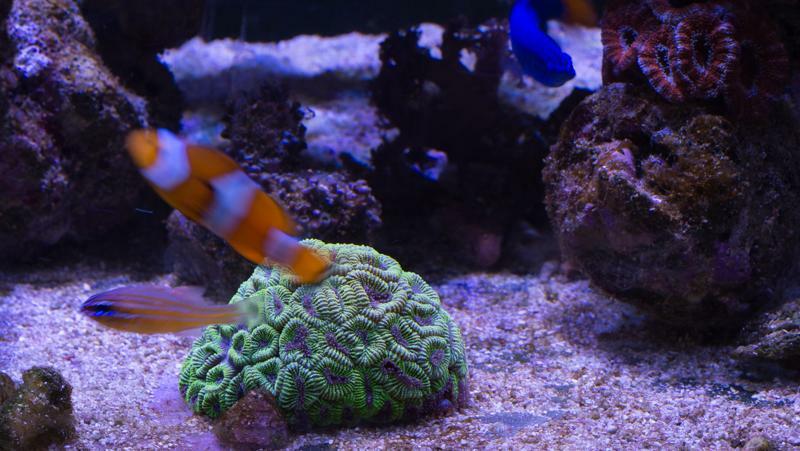 “Their laboratory has been set up with a portable microscope, small aquariums, and proper lighting to replicate the sun, and they have been able to record what happens when sediment is introduced to the coral tissue with time lapse video,” he said. Iona College marine studies teacher, Neil French, said the project had provided the students with an engaging classroom experience and fostered their scientific thinking. “By working on a real-world scientific project and building it into the broader marine studies classroom framework, the students have been able to develop their evidence-based decision-making and analytical skills. It has also allowed them to engage with a working scientist and to directly impact their community and the environment around them. Mr Lewis plans to publish the results of the citizen science project and students who have correctly followed scientific protocols may even be given the opportunity to have their names included on the journal article as co-authors. “To have the names of high school students on a published paper is really unheard of, but it will hopefully be a long-lasting reward for all the work they have put in to this initiative,” Mr Lewis said.